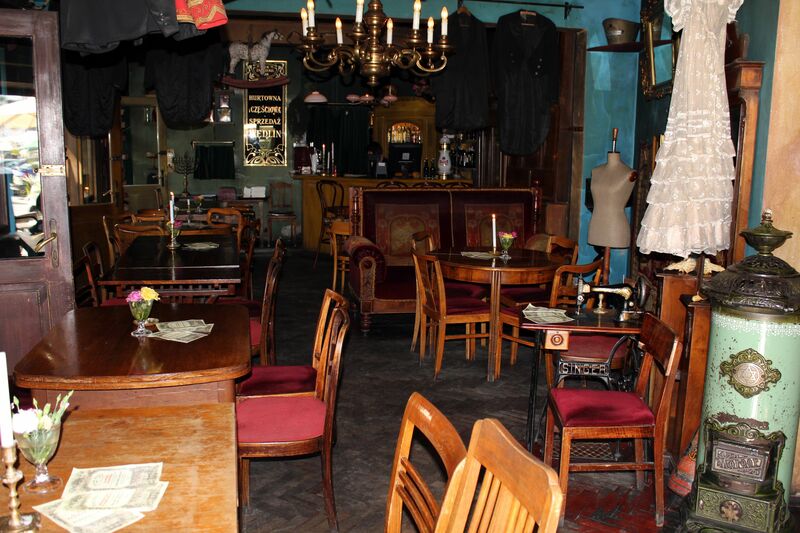 Once Upon a Time in Kazimierz is a Jewish restaurant offering the sentimental journey to the old Jewish traditions in Krakow, eating out surrounded by settings from the turn of the 20th century, in an ambiance of old workshops and stores with the Klezmer music in the background. Once upon a time Kazimierz was a busy Jewish settlement founded back in the 14th century by the Polish king Kazimierz the Great. With time Kazimierz was gradually “absorbed” into the agglomeration of the greater Cracow (then capital of Poland). Despite this inevitable integration with Gentiles, the Jewish community enjoyed relatively peaceful coexistence and a great deal of commercial liberty. At the dawn of WW2 Kazimierz was a lively Jewish district with well developed chain of small businesses and stores where mutual interests of Jews and Poles have been transforming the “coexistence” into a sort of “harmonious cooperation”. These two communities mingled together, worked alongside one another, they were shopping in the same stores, although interestingly they differed in almost everything else –be it language, culture, traditions, religion…..
WW2 left terrible destruction, not only in a human dimension or infrastructure. It was almost equally tragic that it completely erased hundreds of years old cultural heritage of Polish Jews….. These days Kazimierz is coming back but mainly as a popular bohemian district with numerous fashionable cafes and restaurants operating till deep night. Unfortunately the attempts to revive its old Jewish character and raise public interest in Jewish culture are not that successful (Festival of Jewish Culture usually held in the first week of July is a praiseworthy exception). Restauracja "Dawno Temu na Kazimierzu"
But there are also other exceptions and that is how we come to the project called “Once Upon a time in Kazimierz” (“Dawno Temu na Kazimierzu”). 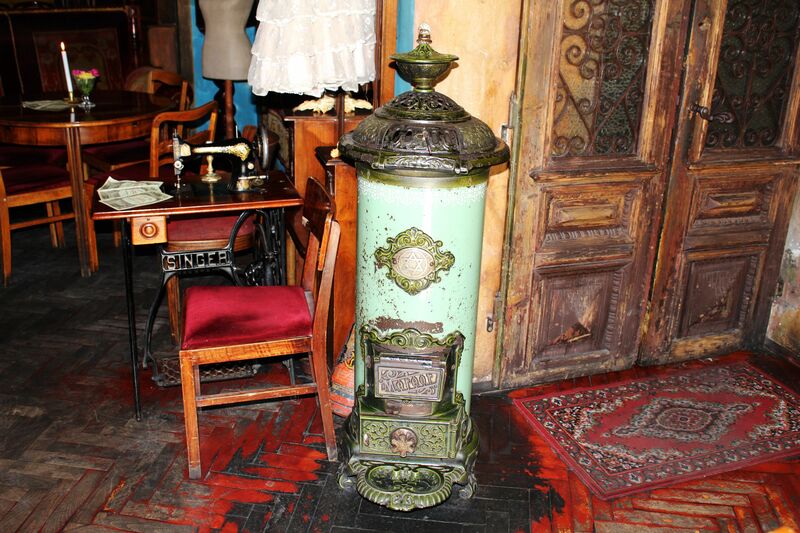 Imagine wondering along the narrow streets of Kazimierz at the turn of the 20th century. Passing by decaying facades of mostly two story buildings in an ocean of colorless grayish tones, here and there you will spot signs of small family-owned shops lining the streets. Crowd of passersby like ants tirelessly move back and forth along vibrant streets carrying some bundles,..... life goes on…..
Well, almost hundred years later this scenario was recreated by Mr. Dominik Dybek - the owner of the restaurant “Once Upon a Time in Kazimierz”. Walking down the Miodowa Street in the heart of the Jewish Kazimierz you will pass in front of shabby-looking little shops. Visibly weathered paint on the frames of small display windows, seemingly worn-out wooden doors and discolored signs bring the memory of a long forgotten time when “stuff” was selling itself (and only because someone really needed it…..). The large frontal signs proudly announce Benjamin Holcer’s carpentry shop, Chajim Kohan general store, Stanislaw Nowak’s grocery store and Szymon Kac’s “Fashion Shop” (keep in mind that fashion is not something that we discovered recently!).…. But unlike in the past, these days behind the mock frontal wall you will find an open space housing a restaurant mistily called “Once Upon a Time in Kazimierz”. With the internal walls torn down, the former little premises are separated only by the virtual dividers, visible thanks to the “inherited” décor from their past. 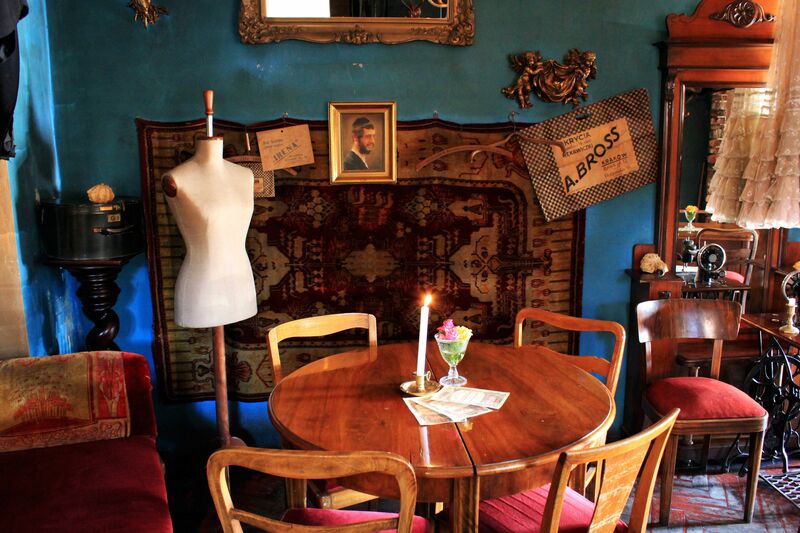 You will find the section with mannequins, sewing machine (Singer of course), hanging typical Jewish garments and a beautiful white dress – reminiscent of Mr. Szymon Kac’s business. 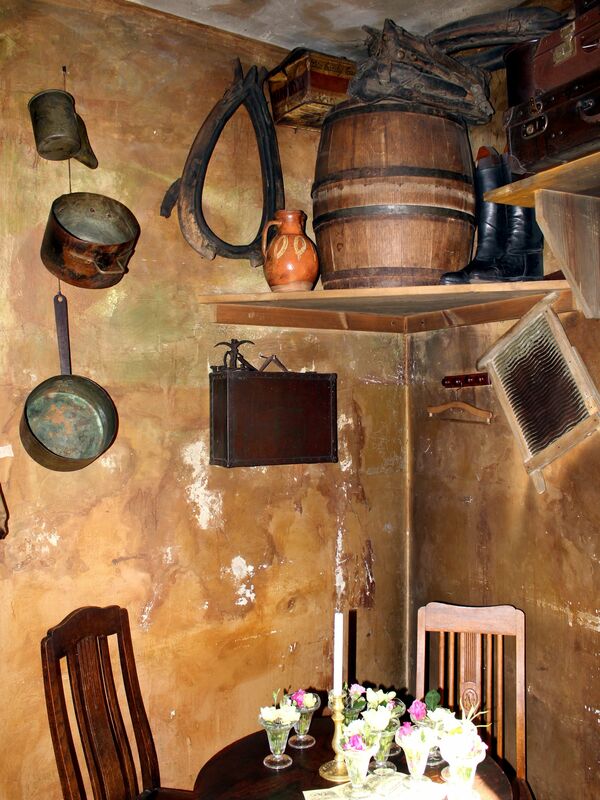 An original carpenter’s workbench in a corner serves as the table for guests. Next to it a set of carpenter’s tools and dilapidated pieces of furniture evoke the time of Mr. Holcer’s hardship. An antique stove bearing the Star of David equally proudly displays the logo of its probably long gone manufacturer Meteor (?). Preserves, groceries, jugs, musical instruments and all kinds of sometimes difficult to identify “stuff” stored on the shelves, hanging on the walls and from the ceilings remind that the General Store well deserved its name “general”….. All these memorabilia otherwise useless on their own, here suddenly regained their significance providing a vital connection with the past. 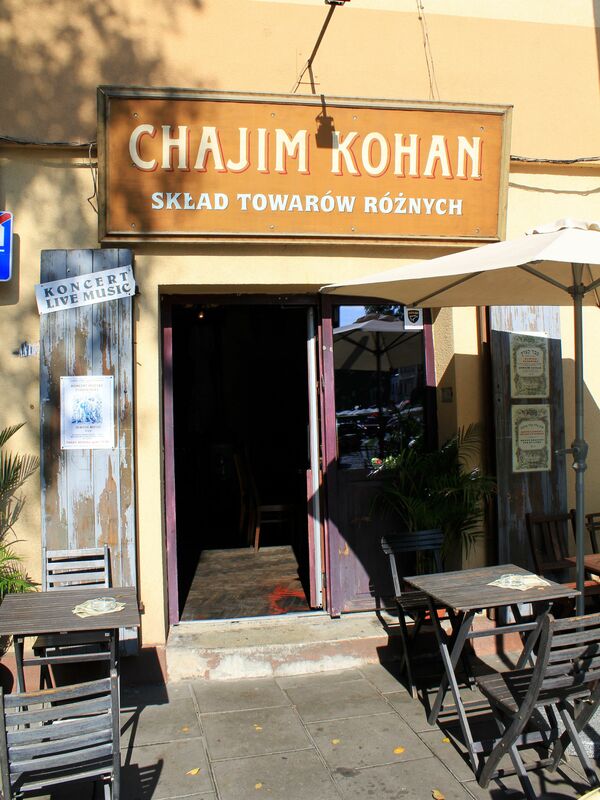 The restaurant offers Jewish cuisine with strong Polish influence. Some may say that actually it is other way around, but honestly claims on both sides are not conclusive. It seems that “cuisine” is rarely a battleground for “purism”. Taking advantage of this “lawlessness” various culinary “delicacies” can easily find their way to any kitchen and then in disguise claim to be “traditional”. From the menu, overwhelmingly the best note gets roasted duck with cranberries. 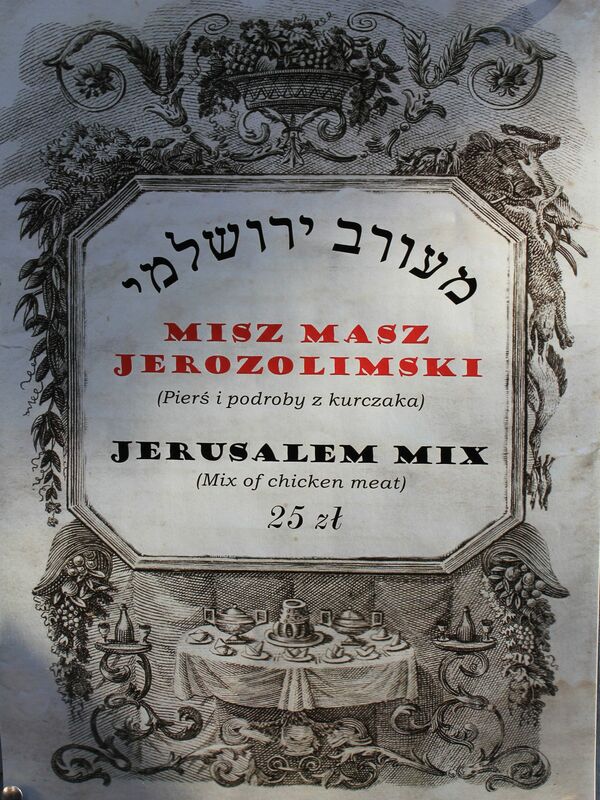 You may also try Czulent (Cholent) - a Jewish stew being a mix of beans, chickpea and barley with beef, veggies and everything else you can have in the kitchen!. This slow cooking dish (if prepared correctly it takes about 12 hours of stewing) is an answer to the Jewish religious laws (Halachah) requiring serving warm food on Sabbath when cooking (making fire) is strictly forbidden. Preserves, groceries, jugs, musical instruments and all kinds of sometimes difficult to identify “stuff” stored on the shelves, hanging on the walls and from the ceilings remind that the General Store well deserved its name “general”…..
Like in every self-respecting restaurant in Krakow there must be a little "garden" (even it that only means few tables on the sidewalk...). 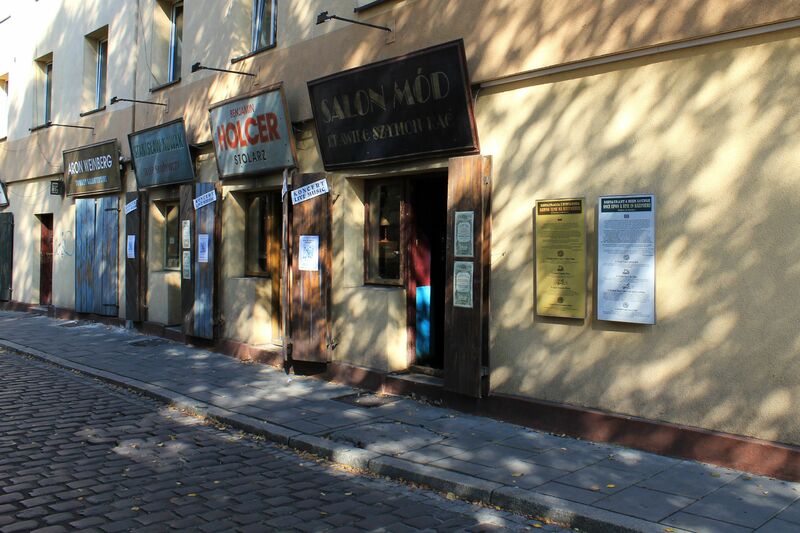 The restaurant is a MUST for all those willing to re-discover Kazimierz’s past, to travel back in time and feel the touch of once upon a time vibrant Jewish town. To breathe the atmosphere typical of pre-WW2 small family owned shops, to live this unforgettable journey not in the movie theater but in the reality of Kazimierz streets and full of history surroundings. To just sit and watch as the world goes by, listening to the mystic tunes of the background music by Kroke (an instrumental group founded in Krakow in 1992 promoting the Klezmer music with strong Balkan influence. The band's name in Yiddish means Kraków). The menu is just the bonus the same way as the live concerts of more or less melancholic Yiddish music (usually Mondays and Tuesdays nights, but please check before going! ).